The International Monetary Fund warned this week of a further weakening of the global economy following the release of figures showing a significant decline in Chinese and global trade. He noted that emerging markets experienced a capital outflow of $200 billion last year compared to a net inflow of $125 billion in 2014. “Trade flows meanwhile are being dragged down by weak export and import growth in large emerging markets such as China, as well as Russia and Brazil, which have been under considerable stress,” he said. Lipton made his remarks following the release of data showing that Chinese exports experienced their biggest contraction since 2009. It was another sign that, far from the world economy being on the road to “recovery,” global demand is continuing to fall. Chinese exports in February were down by 25.4 percent in dollar terms from a year earlier, after falling by 11.2 percent in January, while imports declined by 13.8 percent, after dropping by 18.8 percent in January. While the figures may have been somewhat distorted because of issues related to the lunar New Year holiday, the combined January and February falls add up to a marked decline over the previous year, and no one is expecting the March data to show any improvement. The Chinese results are the latest in a series of reports showing a decline in world trade, especially over the past two years, as a result of intensifying recessionary trends. In the years before the financial meltdown, world trade grew at about twice the rate of growth for the world economy. Since 2011, it has been in line with or even below that figure. Last year, the value of global trade fell by 13.8 percent in dollar terms, the first contraction since 2009. Figures released last week for the US, the world’s largest economy, show the same trend as the second largest economy, China. US exports fell by 2.1 percent, while imports were down by 1.3 percent. The value of goods exports from the US was the lowest since February 2011. Lipton concluded his speech by repeating the official mantra that “global economic recovery continues.” However, everything that came before showed the opposite to be the case. He claimed the G20 meeting had recognized that the global economy remained too weak and had provided “some reassurance that countries stand ready to act if necessary.” In fact, such are the divisions within the G20 that proposals for cooperation did not even make it onto the agenda of the meeting. As a number of media reports noted, the gathering was characterised by the efforts of every country to blame every other country for the worsening situation. Lipton pointed out that the decline in stock market indices for this year implied a loss of market capitalization of more than $6 trillion, equivalent to about half the total losses incurred in the most acute phase of the 2008 financial crisis. 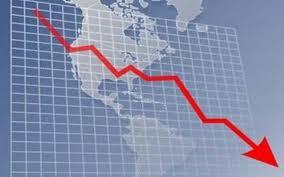 While the decline on a global scale was 6 percent, some markets had experienced losses of 20 percent. He warned that protracted low global demand coupled with financial turbulence created the risk of “negative feedback loops” between the real economy and markets, generating deflation and “secular stagnation”—a situation where the level of savings permanently outstrips the demand for investment funds. In other words, low global demand, in large measure the result of low investment, leads to financial volatility, which in turn leads to reductions in investment, further lowering demand. Lipton said commodity exporters had to recognise that commodity prices “may well be permanently lower.” This assessment has also been made by Goldman Sachs, one of the largest banks operating in commodity markets. In a series of reports issued this week, it said the recent spike in prices was likely to be temporary, and the 20-month decline had further to run before supply was cut and markets rebalanced. Lipton repeated the now obligatory statement from the world’s major economic institutions that the lessons of history had to be learned and zero-sum policies, in which one country attempts to alleviate its position at the expense of others, had to be eschewed, because in the long run, they made all countries worse off. One of the chief mechanisms of such zero-sum games is competitive currency devaluation. But such measures are being intensified, not reduced. While all central banks insist that their quantitative easing programs, through which they pump money into the financial system, together with negative interest rates are not aimed at lowering the value of their currency, this is their effect. Following the decision by the Bank of Japan to introduce negative interest rates at the end of January, a further step in this direction is expected today when the European Central Bank governing council meets. It is widely forecast to extend its quantitative easing program and take interest rates further into negative territory, exacerbating the tensions in financial markets.